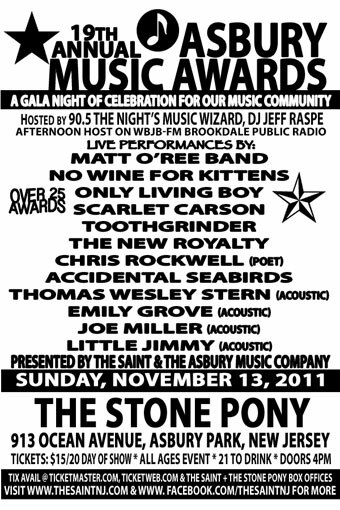 Sunday, November 13, 2011 - The 19th Annual ASBURY MUSIC AWARDS, Presented by THE SAINT in Asbury Park & The Asbury Music Company, will be held at The Stone Pony, 913 Ocean Ave., Asbury Park, New Jersey. A gala night of celebration and music, and a long held tradition for our local music community, hosted this year by 90.5 The Night's Music Wizard, DJ Jeff Raspe, afternoon host on WBJB-FM Brookdale Public Radio. Featuring over 25 Awards! Live Musical Performances by: Matt O'Ree Band, No Wine For Kittens, Only Living Boy, Scarlet Carson, Toothgrinder, The New Royalty, Chris Rockwell (poet), Accidental Seabirds, Thomas Wesley Stern, Emily Grove, Joe Miller, Little Jimmy and Special Guests. Doors 4pm, Advance Tickets $15/$20 Day of Show. An All Ages Event, 21 to Drink, Tickets on sale now at The Saint and The Stone Pony Box Offices and at www.ticketweb.com and www.ticketmaster.com. All 2011 AMA Nominees admitted free of charge. The Asbury Music Awards, originally known as The Golden T-Bird Awards, premiered in Asbury Park in 1993. An annual music scene staple, the first Asbury Music Awards was held at the former T-Birds Cafe on Main Street in Asbury Park, NJ. Scott Stamper, owner of The Saint in Asbury Park & the Wave Gathering Music Festival founder, along with Peter Mantas, Langosta Lounge's entertainment director, founded, and originally designed the Asbury Music Awards in 1993 as a response to the area's hardworking musicians, singers and songwriters, and the longstanding, ever-evolving Live Original Music scene in and around Asbury Park, NJ. Inspired by a strong desire to give something back to the musicians and music community who make up the Jersey Shore's incredibly diverse music culture, Scott Stamper began presenting the awards to the many talented musicians, singers and songwriters who had presented live original music and paid their dues in the various music rooms in the area. Some of the Asbury Park music venues present day include The Saint, The Stone Pony, The Wonder Bar, Asbury Lanes, Rosie's Cafe, and more. Outside of Asbury Park, The Brighton Bar in Long Branch, Starland Ballroom in Sayreville, and The Court Tavern in New Brunswick, to name a few. The 1993-1994, the Asbury Music Awards took place at T-Birds Cafe. Scott Stamper and Adam Weisberg opened the legendary music venue, The Saint, in 1994, and moved the show due to rapid growth. At this time, the show was renamed the Asbury Music Awards (in 1995). For two years, The Saint hosted the gala celebration for local artists, singers and songwriters, but the show quickly outgrew the venue. To accommodate the burgeoning crowds, the Asbury Music Awards moved to The Fastlane in 1997, The Stone Pony in 1998, and The Tradewinds in Sea Bright in 1999. This Tradewinds was a banner show, drawing over 800 attendees. The Stone Pony hosted the Asbury Music Awards in 2000 and 2001, The Tradewinds in 2002, and since 2003, The Stone Pony has been the host of the Asbury Music Awards. In addition to the recognition the Asbury Music Awards provides to local musicians, singers and songwriters, the shows have also proven a great opportunity for music fans, promoters, artists, media, local venues and the music community on a whole to experience the incredibly diverse talent in a wide variety of musical genres in one special and intimate evening of music and celebration. Over the years, the Asbury Music Awards stage has been graced by New Jersey luminaries Nicole Atkins, Rick Barry, Status Green, Kid With Man Head, Outcry, Samhill, Evelyn Forever, Barry and The Penetrators, What About Frank, April Smith, The Soul Project, Woodfish, A Love Like Pi, Stringbean & The Stalkers, Brown, Last Days of Empire, Green Tag Sale, Chris Batten and The Woods, Amanda Duncan, Joe Harvard Band, George Wirth, Turtle Soup, Last Perfect Thing, Outside The Box, Karmic Juggernaut, Low Flying Jets, Lance Larson, Twine, Keith Kenny, Phil Benson, Matt O'Ree Band, Parlor Mob, Eryn Shewell, Allie Moss, Readymade Breakup, Maybe Pete, Bob Burger, Christine Martucci, Tony Tedesco, Days Awake, Sekond Skyn, Chemtrail, River City Extension, Alex Brumel and Janel Elizabeth, Cara Salimando, Jo Wymer & The Itty Bitty Band, Quincy Mumford, Domino Effect, The Black Clouds and Laura Warshauer, to name just a few. So much goes on behind the scenes in planning and preparation for the Asbury Music Awards. The nominees and performers are selected by a panel of industry veterans which include promoters, sound technicians, radio personalities, music writers and club owners. Artists that have graduated to a major label or those who have won or been nominated for a particular category for five consecutive years at the Asbury Music Awards are eligible for "Record of The Year" and "Best Thing To Happen in Asbury Park," and may appear onstage presenting or performing during the ceremonies, however, they have graduated from being nominated from most if not all other categories, making room for up and coming artists, musicians, singers and songwriters. After the carefully chosen Asbury Music Awards panel convenes and chooses all performers and nominees, the names of the nominees for each category are compiled in ballot format and distributed to a select group of music industry insiders, devoted music fans and local music scenesters. The voting process is not open to the general public, but much effort is put into selecting voters. This method has proven most equitable, as it precludes "ballot stuffing" than can skew results in certain categories. Area clubs, music-related businesses, record stores, radio stations, newspapers and time tested music enthusiasts are all represented in the final voting. Ballots are painstakingly counted, votes are tallied, and the winners are revealed for the first time at the Asbury Music Awards ceremony. A variety of local music alumni, past award recipients, sponsors, and industry professionals are invited by the panel to present awards each year. The Asbury Music Awards believe that live music is what makes Asbury Park so special. Presented by Scott Stamper and Adam Weisberg of The Saint, 601 Main Street, in Asbury Park, and the Asbury Music Company. Year-round, the Asbury Music Awards works diligently to recognize and support local musicians and the music community in Asbury Park, "Where Music Lives" and the Live Music Capital of New Jersey, and beyond. 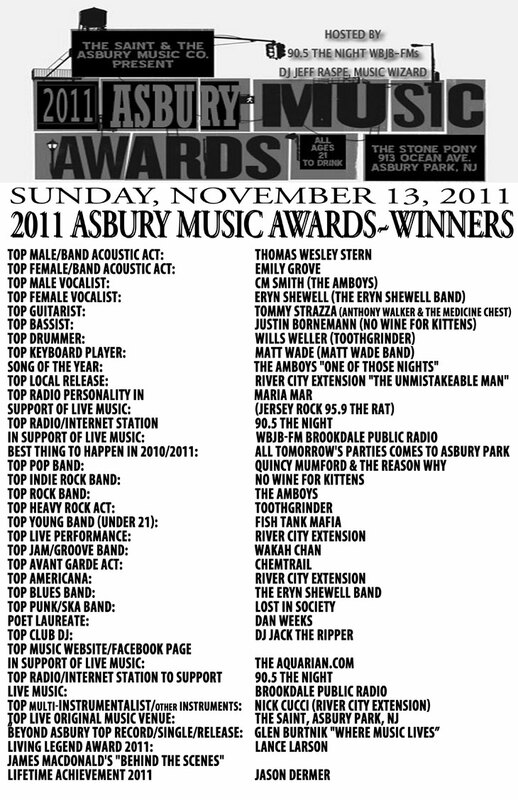 The 19th Annual Asbury Music Awards will be held on Sunday, November 13, 2011 at The legendary Stone Pony, 913 Ocean Avenue, Asbury Park, New Jersey.